Brooklyn, NY – A newly opened community center in Brooklyn hopes to become an epicenter of unity for the borough’s 2,500,000 culturally diverse residents. The Bridge Multicultural and Advocacy Project is the brainchild of Mark Meyer Appel, an outspoken advocate who has been involved in an array of projects including the New York State Early Intervention Center, early childhood education, special education and sexual abuse prevention. Appel hopes that The Bridge MCP will help Kings County’s many ethnic groups unite to work on issues that transcend cultural borders. The Bridge MCP held its grand opening yesterday with several hundred people in attendance for a gala art exhibit, kosher and Caribbean cuisine and live music by Chaim Kiss, saxophonist Buyu Ambroise and the Blues in Red Band. Located on Flatbush Avenue between Avenue L and E 38th Street in a building owned by Appel that had been frequently used for charity events, The Bridge MCP hopes to become both a site for grassroots community projects, a location for community events and the site of a library, computer lab and television station. Appel stressed the importance of better understanding of the many unique populations that call Brooklyn home. Among those in attendance at yesterday’s grand opening were Public Advocate Letitia James, District Attorney Ken Thompson, Assemblyman Dov Hikind, City Councilmen Dr. Mathieu Eugene, Chaim Deutsch and Jumaane Williams, Assemblywoman Rhoda Jacobs, Assemblywoman-Elect Rodneyse Bichotte, Rabbi Yeruchim Silber and Rabbi Joseph Potasnik. Ezra Friedlander, CEO of The Friedlander Group, who was honored at yesterday’s event, noted the importance of various ethnic groups working together to solve common problems. 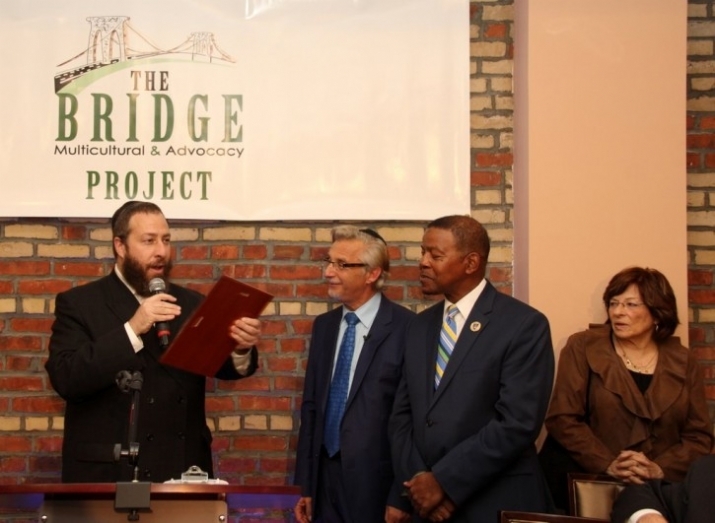 “It’s important for us who live in vibrant Jewish communities and don’t have the opportunity to interact with those who don’t share our background to ‎recognize the importance of fostering collaborative relationships with other communities and that’s what makes the Bridge Project so important,” said Friedlander.